For more than two years now, a fierce civil war has been tearing Syria apart. Forces loyal to the Ba’ath government and president Bashar al-Assad are battling with rebel factions seeking to grab control. Caught in the middle are innocent families who live in constant fear of violence. GiveDeath and insecurity have forced millions of Syrians to run for their lives, with more than two million already seeking refuge in neighboring Turkey, Lebanon, Jordan, and Iraq. Three-quarters of these refugees are women and children, according to United Nations reports. This past August, Iraq offered asylum to Syrians who were camped out along its northern border. They built a float-bridge across the Tigris River, and in just one day, nearly 30,000 people—with nothing more than the clothes on their backs and the few possessions they could carry—streamed into the country. Every day since then, an average of 5,000 people flee Syria. Samaritan’s Purse was closely monitoring this large influx of refugees. Within hours, we assembled a team and had it on the ground assessing the situation in northern Iraq. Our team soon discovered that the government was providing three meals a day for more than 190,000 refugees, while supplying sufficient shelter, medical care, and in some cases even electricity. But there were other people—families unaccustomed to asking for help—falling through the cracks. Samaritan’s Purse identified and worked to fill these gaps in the government’s response. Samaritan’s Purse partnered with a local church to develop a standard household relief kit for distribution to families who live in the host community of Erbil. This kit provided a supplemental food ration that can last up to one month. We trained church leadership on how to manage the inventory and efficiently pack the individual kits. 172,000 Syrians have taken refugee in northern Iraq. Most are living in temporary camps. Each kit included cooking oil, rice, bulger, chickpeas, lentils, sugar, beans, spaghetti, macaroni, powdered milk, and tomato sauce. So far, a total of 74 household relief kits have been distributed to approximately 365 individuals. The team purchased enough additional commodities to support our ministry partner in assembling another 300 kits. One of the kits made it into the hands of Salih, a father of five, who left his home and factory job making shoes in Syria for safety in Iraq about five months ago. Salih found out about the kits from a local believer who saw him on the street and, like the Good Samaritan, did not pass by on the other side. “I heard about the distribution when a church member stopped to give me some extra change and invited me,” he said. Salih is disabled and cannot find a job. He spends most of his time begging for money at busy intersections. Salih was grateful for what Samaritan’s Purse provided through the local church. The extra food for his children was a respite from some of the daily pressure of putting food on the table. 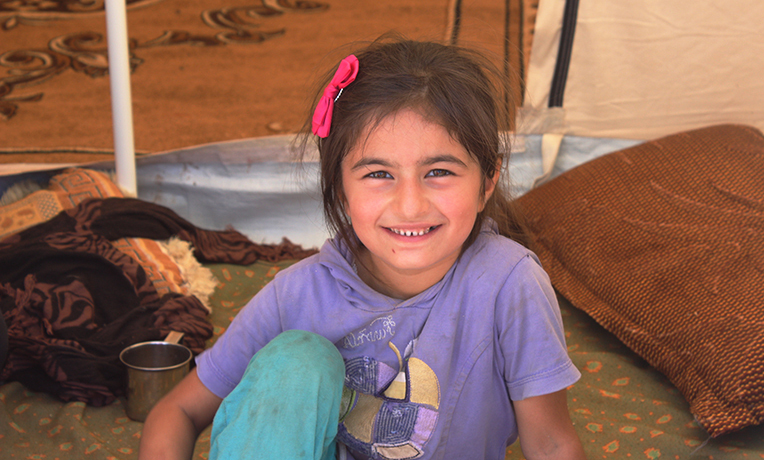 More than 1 million children have been forced to flee the violence in Syria. The team went on to purchase tons of basic commodities such as rice, sugar, lentils, chickpeas, cooking oil, baby diapers and nutrition, and shoes. 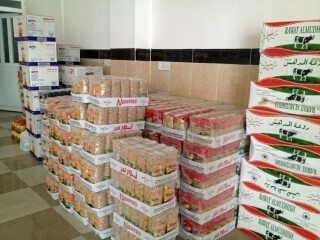 They were delivered to refugee camps outside of Erbil and near Sulaymaniyah. 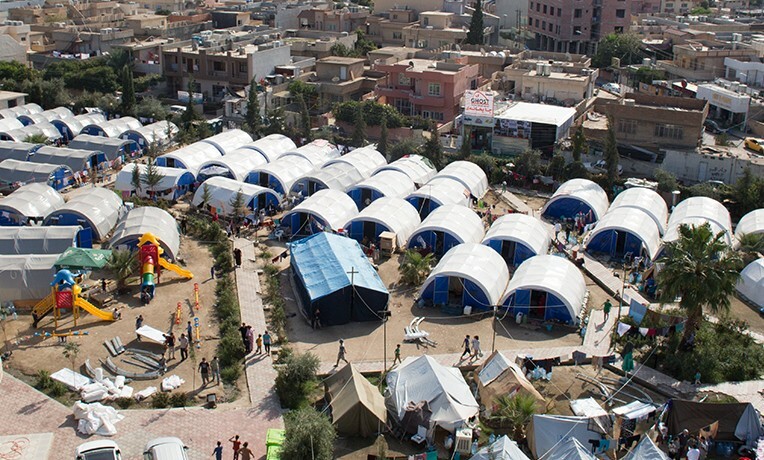 We also distributed 300 mattresses and 7,000 diapers to a camp in a remote area about two hours northeast of Erbil. This camp has a refugee population of 235 families and is composed of 95 pre-existing block homes that were built to house workers as part of a defunct dam construction project. 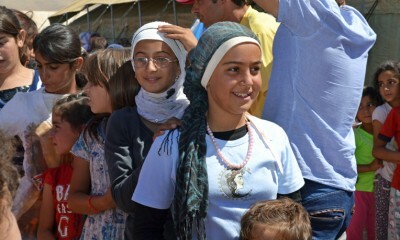 Multiple families live in each house and the regional government is providing the camp population with food and water. Samaritan’s Purse is providing food and other items for thousands of refugees. Samaritan’s Purse worked through our local church partner to provide food for Hanadi and her family.